Whalers in Norway continue to carry out commercial whaling despite falling demand for whale meat and a decline in the number of boats hunting each year. 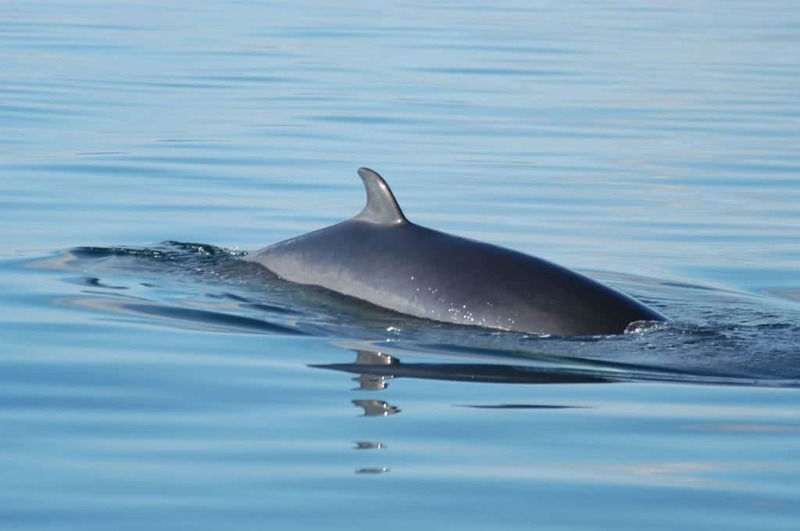 Norway hunts minke whales under an 'objection' to the International Whaling Commission's (IWC) global ban on commercial whaling, which came into effect in 1986. Initially, the hunts were undertaken under the guise of ‘science’ but in 1993, Norway resumed full-blown commercial whaling, citing this ‘objection’. Minke whaling in Norway is conducted by fishermen, the vast majority of whom resume fishing activities outside the whaling season. The hunts rely on state subsidies and the government is constantly searching for new markets to exploit, with young people and tourists their main targets. Norway kills minke whales under a self-allocated quota, currently 1,278 for the 2018 season which began on 1st April. This increased quota (up from 999 in 2017 and 880 in 2016) seems largely symbolic, since the number of whales killed over the years has usually fallen far short of the official quota. 2017 saw the lowest number of whales killed in Norwegian waters since 1996 and also the lowest number of vessels actively whaling for 25 years, begging the question: why increase the quota for 2018? The answer lies partly in the Norwegian government’s defensive stance towards whaling. Norway tries to claim that its whaling is ‘sustainable’ and must be carried out because ‘whales eat too many fish’. In January 2018, Fisheries Minister, Per Sandberg, wrote an opinion piece denouncing as a ‘vicious myth’ the idea that whales are endangered and claiming that Norway conducts a ‘balanced study’ of whales because sustainability is an important factor. He went on to state that the Norwegian government spends a great deal of money on research to prove that whales eat “as much fish as humans do”. WDC says: "We must counter the illogical - and untrue - argument made by whaling nations that they need to kill whales to protect fish stocks. Illogical, because, in the same breath, the Norwegian government assures us that its whaling is ‘sustainable’ and not impacting whale stocks (they can’t have it both ways! ), and untrue, since researchers have mapped fish catches against species which whales eat and have demonstrated that there is little overlap with human fisheries. This is because whales largely catch species we don’t target, in areas where we don’t fish! Any blame for declining fish populations lies squarely with humans. By contrast, WDC celebrates whales as ‘ecosystem engineers’ helping to keep our oceans healthy. Pregnant whales are an easy target? Horrifyingly, official stats reveal that, between 2000-2015, over two-thirds (68%) of the minkes killed by Norwegian whalers were female and over 40% of these were pregnant. WDC says: It is bad enough to know that many whales die in terror and agony, but a further sickener is the knowledge that many are pregnant females, gifting the whalers a grisly ’two for the price of one’. Is a steak harvested from a terrified pregnant whale really that appetising? There’s also a great deal of anger over methods used to kill the whales, as well as the sheer wastage involved in the hunts. We think you will be as horrified as we were to learn that it is common for the whalers to remove prime cuts of meat from the dead whale and then toss the rest of its carcass overboard, often in view of other boats or close to shore. In August 2015, communities in northern Norway raised a public outcry against the dumping of whale remains, with one local stating, ‘I found stinking whale stomachs, blubber and intestines floating in the fjord and stuck on land’. Whaler Bjørn Andersen, who had been hunting in thearea, admitted that this was a common practice. And in August 2017, WDC reported that campaigners from Germany had filmed whalers killing a minke whale. According to their footage, the whale did not die instantly and probably suffered a great deal, before being finished off by rifle. The whale’s carcass was then ‘bled out’ and its blubber dumped overboard, in full view of a nearby vessel with young children on board. Norway allows its whalers to hunt hundred of whales each year. Help us end this cruel industry once and for all. Who eats minke whale meat? Despite massive government subsidies and marketing campaigns over the past 25 years, domestic demand for whale meat is declining within Norway and fewer than 5% of Norwegians - mostly older people - regularly eat the meat. This decline has forced the industry to be more creative in its attempts to spark an interest in whale meat in other sectors of the population. However, efforts in recent years to promote products such as whale burgers and whale sushi to students and young people attending popular Norwegian music festivals such as Bukta, Træna or Inferno, have largely flopped. In early 2017, we reported on efforts to offload around 60 tons of Norwegian minke whale meat to ‘needy people’. However, this apparent act of philanthropy was swiftly revealed as a PR stunt, as the meat - donated by Myklebust Hvalprodukter, based in western Norway and one of the country’s largest whale meat processors and exporters - was nearing its sell-by date! Clearly panicked by local disinterest, the Norwegian government’s response is to go on the attack. In January 2018, Mr Sandberg declared that he wants to boost demand for whale meat, exclaiming "I want to make sure that whaling stays alive!" Whilst acknowledging that public demand for whale meat is falling, Sandberg said that he will support a marketing programme aimed at encouraging Norwegians – especially children and young people - to eat more whale meat as it is a ‘tasty and healthy food’. Tourists are a prime target for those marketing whale meat, which is sold in supermarkets, dockside fish markets, restaurants and aboard cruise ships. Skincare products and supplements containing whale, such as ‘whale oil’ capsules and skin creams, are also widely available. It could be that many tourists have yet to realise that, by purchasing whale products, they are helping to perpetuate an industry that could otherwise have died by now. Following the success of our outreach campaign to tourists visiting Iceland, which dramatically reduced demand for whale meat , we’re reaching out to tourists to Norway with a similar message: please don’t eat whale! We hope tourists will lose their appetite for whale meat once they realise the steak on their plate may well have come from a terrified pregnant whale. Prior to the ban on commercial whaling, Norway exported over 50% of its whale products to Japan. After the moratorium, Norway originally agreed to halt trade in whale products, but resumed exports in 2001. Isn’t it illegal to ship whale meat halfway across the globe? Sadly no. As is the case with Icelandic whale meat exports, the shocking truth is that Norway, along with Japan and Iceland, holds a ‘reservation’ against the listing of minke whales under Appendix 1 of the Convention on International Trade in Endangered Species (CITES) and, therefore, can legally trade whale products with each other. Exported meat not fit to eat? February 2013: 4,250 kilos of frozen whale belly meat, blubber, tails and fins were exported to Japan. The shipment sailed aboard the ECL Commander to Rotterdam where the meat transferred to the NYK Olympus before sailing on in early March, transiting Le Havre, Hamburg and Southampton, before heading on to Japan via the Suez Canal. 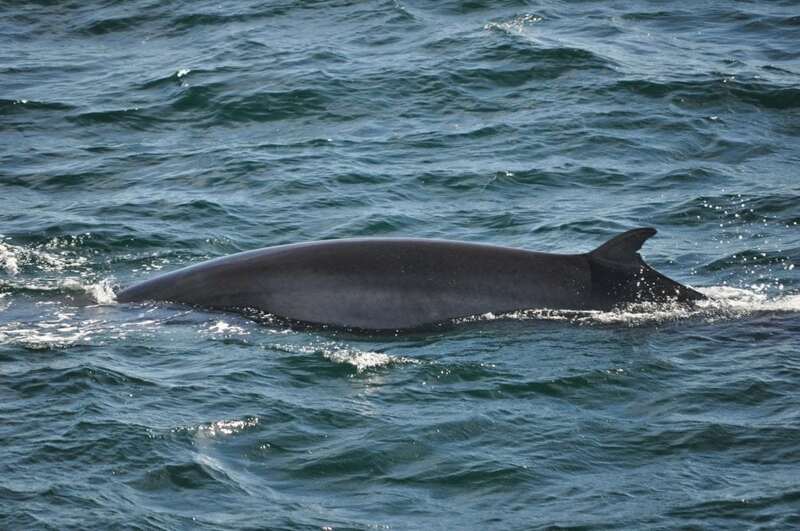 March 2015: Japan dumped a shipment of Norwegian minke whale meat after routine safety tests discovered that it contained up to twice the permitted level of aldrin, dieldrin and chlordane. These pesticides are banned in some countries and suspected of causing birth defects, neurological harm and some cancers if consumed in high quantities. October 2016: 3,455 kilos of whale meat were shipped to Japan via Hamburg. July 2017: 432 kilos of whale meat was exported to the Faroe Islands. The EU currently allows ships carrying whale meat and products to dock at their ports, despite the UK and many EU countries being opposed to whale hunting. Icelandic and Norwegian whalers have shipped and transferred whale products through ports such as Southampton, Rotterdam and Hamburg in the past. 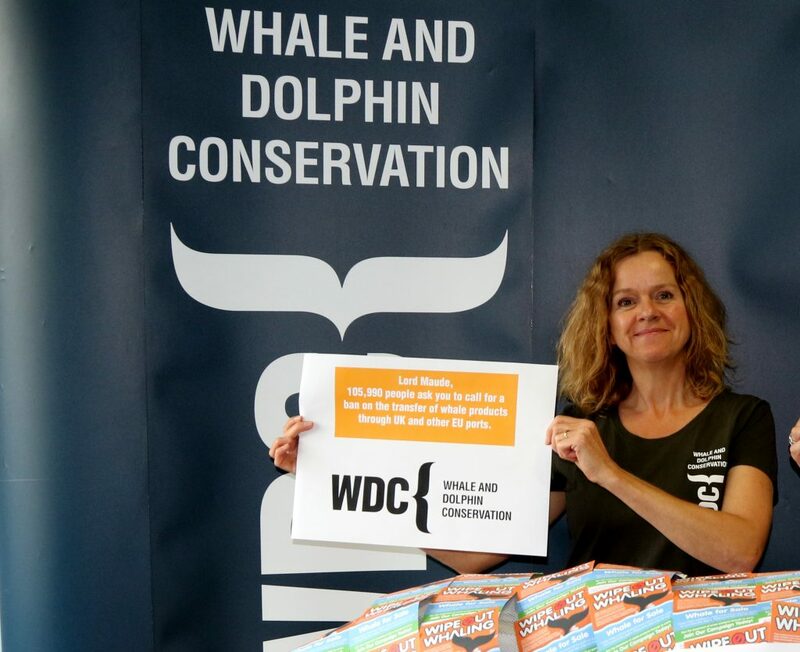 Over 100,000 people recently joined the WDC campaign to bring an end to this practice, which was further boosted by a resounding show of support from European MEPs, an overwhelming majority of whom voted in favour of a resolution to end the shipment of whale meat through EU ports. The Resolution gives a clear mandate to the EU Commission to do its utmost to end the EU's indirect support of Norway's whaling activities, calling on the Commission to ‘look into all possible ways of ensuring that whale meat is no longer legally allowed to transit through EU ports, including by recommending a ban on such transits as an exceptional measure.’ The resolution also calls on Norway to cease all its commercial whaling operations and to abide by the current international ban on commercial whaling and the international ban on trade in whale meat and products. WDC says: We worked very hard, alongside NGO colleagues, to secure the support of MEPs on this issue. We are delighted with the outcome as it sends a strong signal to the EU Commission and all Member States that killing whales is cruel, unnecessary and not at all in line with EU policies. We will fight on to turn this political support into a legal ban. Whalers much prefer to keep the public, including their own population, in the dark, feeding them misinformation. The very last thing they want is for anyone to shine a spotlight on their activities, so one of the most important things WDC can do is to publicise the cruelty of their hunts and highlight what people can do to help. Mustered over 100,000 signatures to a petition supporting a Resolution by European MEPs to the EU Commission calling for a ban on the transit of whalemeat from Norway (and other whaling regions) through our ports. Produced flyers informing tourists to Norway exactly why they should avoid supporting the killing by eating whale meat or purchasing products made from whales. Publicised the large percentage of pregnant females killed in the hunts. This is by no means the ‘accident’ the whalers claim but rather, a cynical exploitation of the fact that pregnant whales are easy targets, being larger and slower. Briefed the media repeatedly on the cruelty and wastage involved in the hunts including dumping whale carcasses overboard in view of passenger boats or close to harbours. Worked with whale watch tourism experts within Norway to approach the government, calling for regulations to improve the current industry, as a responsible, profitable whale watch industry is one of the most powerful arguments against whaling: every whale killed is one fewer to be watched.